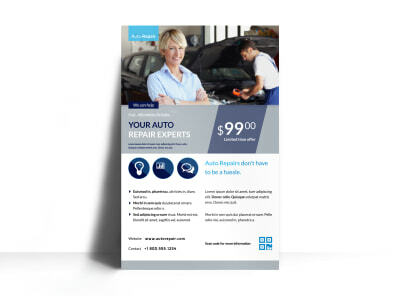 Put your marketing plan in the fast lane with automotive & transportation posters customized using our intuitive editor and inventory of industry-specific templates. Create a poster that garners attention from the street or your office walls using images, artwork, graphics, and text in your choice of colors, fonts, and sizes. Use your customized posters to deliver details of a special promotion or upcoming event, draw interest to a new product or line, or give the 411 on your grand opening. Point-and-click usability brings your poster to life in minutes, no design experience needed. Begin the simple design process now. 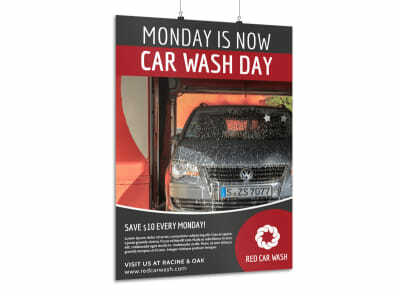 Splish, splash like Bobby Darin as you give all those cars a bath – get the whole gang dancin’ on their own living room rug after they arrive home with a sparkling clean vehicle thanks to seeing your completely customized car wash poster. MyCreativeShop has just the right one for you, whether your car wash is a full-service interior/exterior set-up, convenient pass-through touch free or soft touch wash, or a set of self-service wash bays. Get onboard with our online editor and touch-up little details here and there or give the design a complete overhaul with your own pictures, color scheme, layout, and font. 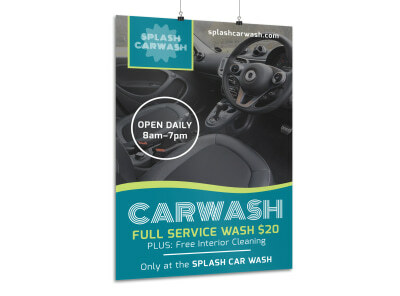 Use the spacious real estate of your poster to feature your wash specials, and you’ll have a party goin’ on before you know it! When you’re selling your car, you want to get the best price you possibly can. 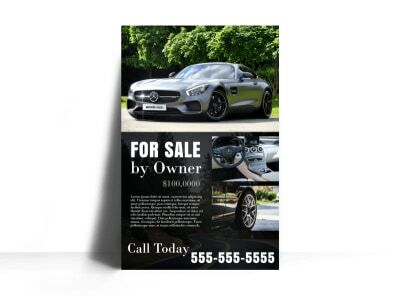 Increase your chances of success by customizing a car for sale poster and hanging it all over town! Going big with a poster gives you the ability to catch the eye of passersby in a BIG way. 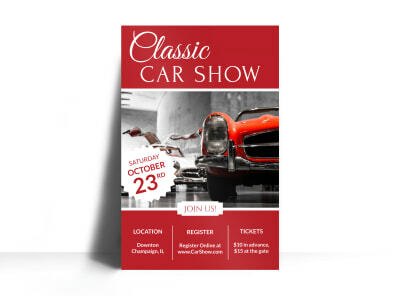 Snag one of our professionally-designed poster templates, then slide behind the wheel of our online design editor to get under the hood and make it your own. Upload a sleek and shiny photo (or more) of your vehicle, freshen up the paint job, and give it a final onceover. 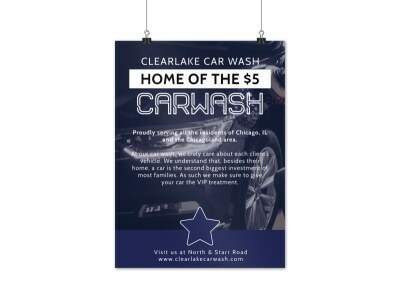 Print and hang the final product around your community, and your car will soon be just a memory in your rearview mirror (and a deposit in your bank account!). Catch the eye of every automobile aficionado from the Tim “The Toolman” Taylor garage tinkerers of your community all the way up to the Jay Leno showroom big leagues by customizing a car show poster that gets car lovers excited about an opportunity to network and talk shop. We’ve got a variety of professionally-designed templates to choose from, and our online editor puts you in the driver’s seat. Upload photos of cars that will be on display and include a daily schedule, along with admission and entrance fees (for those who want to show off their hard work). 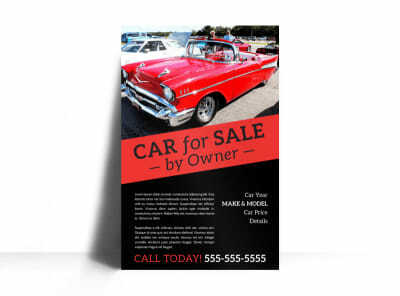 Display your poster around the community at all the hot spots – the waiting room of every auto dealer, the front window (or door) of the best parts place in town, even the local diner. Your event will be running on all cylinders before you even open the doors! Is there anyone who doesn’t love that new car smell? 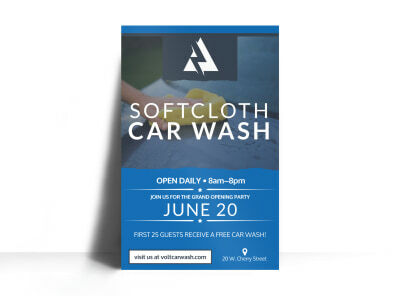 Bring even the most-punished car interior back to its former glory – let your neighborhood know that your shop is up to the task by designing and customizing an auto detailing poster that brings their cars right to your overhead door. MyCreativeShop’s online editor enables you to upload your logo, contact information, and photos of past success stories – you can even add in client testimonials and a sweet promotional offer. 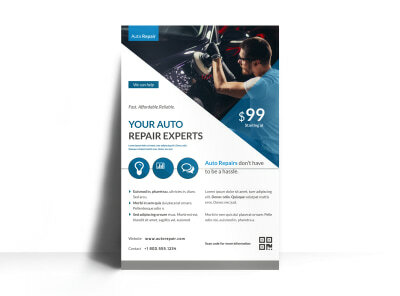 Whether they’re looking to prep their vehicle for sale, in need of a pick-me-up, or are just tired of a messy car, auto owners who see your posters will have your phone ringing off the hook! Need a way to promote your auto shop in your community? Looking to let your long-time and walk-in customers know about pricing, special offers, or educate them on what your services entail? 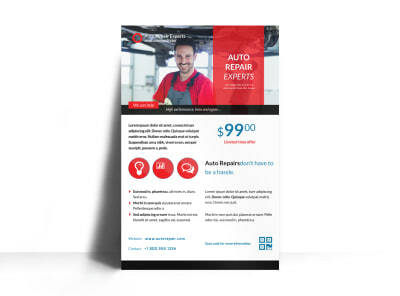 MyCreativeShop’s online editor empowers you to solve any or all of these problems by customizing as many auto repair posters as you require! Design a poster that embeds your shop’s name in potential customers’ memory banks – use eye-catching colors, a memorable slogan, and your phone number (in a HUGE font). 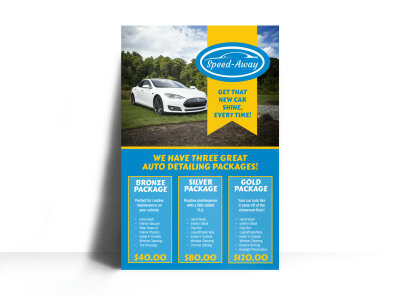 Once you’ve gotten them in the door, create a service menu poster (with prices! ), a deal of the month poster (tire rotations, oil changes, A/C flushes), and another poster with car care tips. Before you know it, your customer list will be jacked up!